The next time you watch someone deliver a presentation that’s bullet point heavy – make a mental note. The speaker will often verbalize the bullet point with a filler word like “um, uh, ah, so, or like”. They’ll actually say “um” where the bullet point is! When I ask students to share the results of their group brainstorming sessions, most begin by reading their lists. Before every item on their list, they usually say, “um’ or ‘ah’. However, when I ask a student to tell me a story that illustrates a point from the list — the verbal fillers almost disappear! When we share stories, we’re less likely to use filler words. 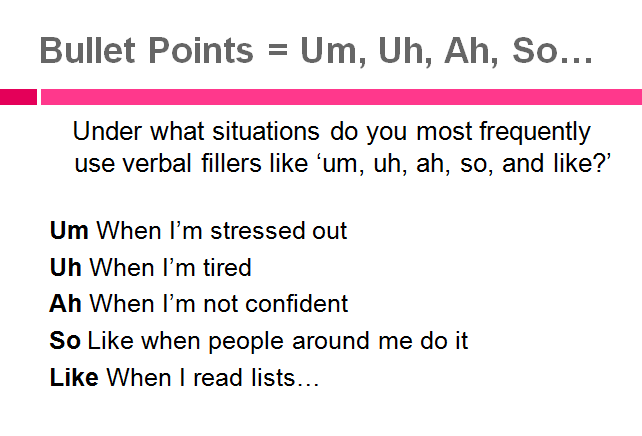 However, when we read lists, we are far more likely to add filler words. Go through your presentation and find any areas where you might be reading a list or using bullet points. How you can transform a bullet point list into a story or a even a series of stories? Look for those opportunities. Eliminating bullet points not only eliminates the ‘ums’ from your presentation — it helps you to better engage your audience with more powerful storytelling. Who else remembers a world before PowerPoint?